Last time we said: Well it looks like silver, but is it? And now we get into an interesting situation. Two different metals, one of which is a silver alloy, and one of which contains no silver at all – with the same name: Britannia. But they have very different markings. The first Britannia was, and still is, a standard measure of silver purity in Great Britain. This metal is 95.84% pure silver and 4.16 per cent copper or other metals. The Britannia standard was enacted in Britain in 1697 to try to prevent craftsmen from melting silver coins and reusing them for flatware and hollow ware. It is traditionally stamped 958. The second form of Britannia contains no silver at all. It is 92% Tin, 6% Antimony, and 2% Copper. It can be stamped “BRITANNIA” or “EPMM”, which stands for “electroplated Britannia Metal”. It is commonly used to make inexpensive hollow ware that is plated with silver. It is also used to make the statues for the Oscars, which are then gold plated. German Silver contains no silver at all. It is actually a nickel alloy. The alloy that I buy contains 65% copper, 17% zinc, and 18% nickel. I use it mostly for chains, like the one in the picture below. It gives the look of silver without the expense. People with Nickel allergies need to avoid German Silver. And just because it is “silver colored” doesn’t make it inexpensive. Some rather expensive metals are “silver colored”, for example, Platinum. For a while there Platinum was even more expensive than gold, but now it has come down a bit and is about $250 less than gold, per ounce. Still not an inexpensive purchase. Platinum is a fairly rare metal and requires temperatures of over 3000 degrees Fahrenheit to cast, so it is rarely used by small independent jewelers. Platinum jewelry can be stamped “Plat”, “Platinum”, ” 900 Platinum”, “950 Platinum” or “586 Plat” depending on exactly the purity level of the metal. There are obviously many other silver colored metals out there, including tin, pewter, lead, chrome, and aluminum. None of these are currently considered to be precious metals. Back in the early 1900’s aluminum was considered to a really amazing metal, because of its silver appearance but light weight. I have seen some incredible engraved opera glasses and hollowware from this timeframe. Today aluminum is used in jewelry manufacture because it is lightweight and can be polished up nicely. But it is not a precious metal. So we have now reviewed the major types of precious metals, which we expect to pay more money for because of the increased cost of the basic materials. 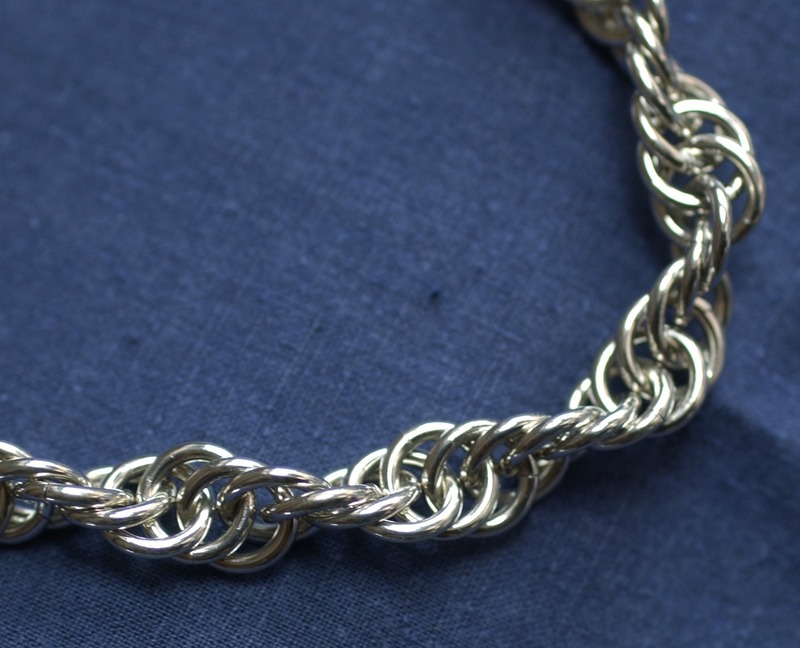 If you are interested in non-precious metals, and why a crafts person, like me, might choose to use specific metals for an assortment of projects, I wrote a blog series about that earlier this year. Choosing Which Metal to Use, talks about what metals were actually used in period and the decisions that modern jewelers have to make.